Remakes are a dime a dozen, motivated by the sure-fire bankability rather than originality. 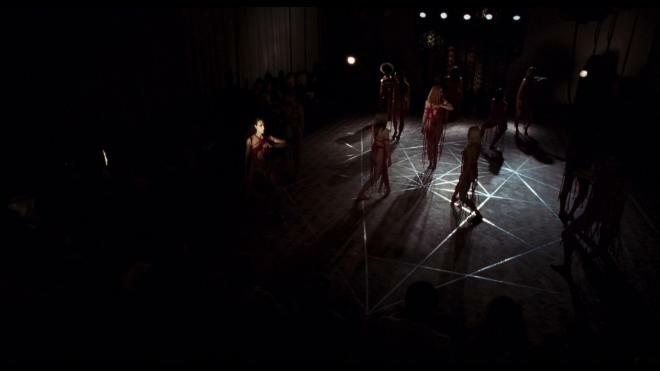 However, Luca Guadagnino's rejiggering of Dario Argento's psychedelic classic Suspiria seems to be motivated by the opportunity to take the basic premise of a naive American dancer joining a remote European dance company and go off in its wildly different direction while maintaining an ever-constant sense of dread. Steeped in social-political themes, there is a lot going on with this Suspiria making it more than an average remake. The result - you're either going to love it or hate it. Regardless of what you think of the film itself, Lionsgate delivers a technically amazing disc with a beautiful transfer and a hauntingly effective Dolby Atmos audio mix. Bonus features are a washout - but this is a film you're going to have to see for yourself and make your own judgment call. Highly Recommended. "When you dance the dance of another, you make yourself in the image of its creator." 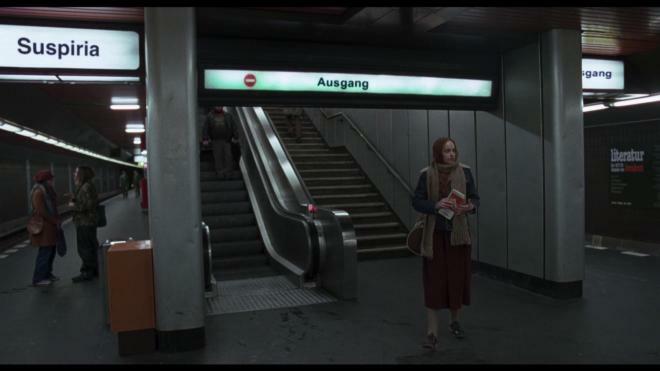 Susie Bannion (Dakota Johnson) has arrived in West Berlin - a city divided not only by a wall and political conflict but the desire to come to terms with the events of 40 years earlier. Having fled from her Mennonite upbringing in Ohio - she has been granted the rare opportunity to audition for the Tanz Dance Academy under the tutelage of Madame Blanc (Tilda Swinton). Showing unparalleled skill, Susie is not only accepted into the company but quickly ascends to the lead replacing the politically factious Patricia (Chloë Grace Moretz) who has disappeared after leaving her journals about the secret diabolical practices of the dance company with her psychotherapist Dr. Josef Klemperer. What do you say about a film like Suspiria? In his followup to Call Me By Your Name, director Luca Guadagnino seems hellbent on making a horror feature that isn't designed for any specific audiences in mind - other than himself. With its plodding pace, fractured structure, the infusion of social-political themes - the film is constantly working to keep the audience at an arm's length while daring the viewer to continue forward. Those already initiated by Argento's colorful psychedelic original may be put off by this rendition's left turns while newcomers who know the original only by name and reputation may be left out in the rain by the plodding misdirections. You are either going to absolutely hate it, or marvel at its brazen approach to the horror genre. 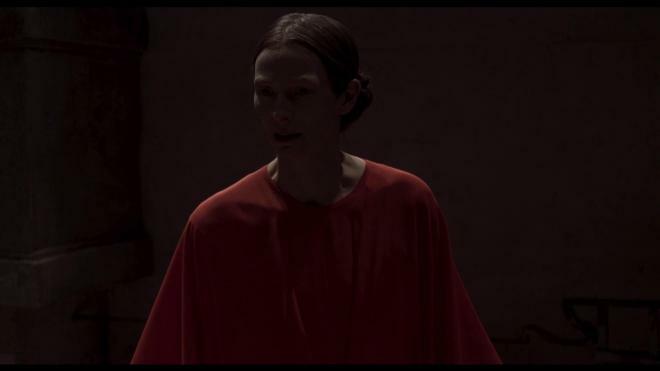 Chalk me up as a lover of Guadagnino's Suspiria. I don't think everything this film tries to do is entirely successful, as it suffers from some existential bloat, but I love that it never once spoon-feeds the audience. The plotline of the film may be similar to the original but it charts its own course for where the material goes beyond the initial setup. I was enthralled by the fact that I never once felt ahead of the film. It takes so much time setting things up, distracting you with little tidbits here and there that you begin to wonder if you're actually watching a horror movie at all - and then you're hit with a truly terrifying and horrific murder sequence that lasts long past being uncomfortable to the point of being fetishistic. Performances are uniformly excellent with Dakota Johnson fully giving herself physically to the character Susie Bannion - even if her character's emotional resonance is deceptively simple. While Johnson may the "lead," this film is actually a tribute to the range of Tilda Swinton giving her many roles to inhabit and bring to life emotionally and physically - and in one case - disgustingly! The cast of side characters are equally impressive in their own ways flavoring the horror to come; Ingrid Caven was a particularly unsettling standout. I'm never bothered by the idea of remakes. They happen all the time so I don't get worked up or bent out of shape about them. Instead, I become curious about what new direction a filmmaker could take the material with it still being somewhat familiar while being different enough to be worth the time. Even when they're at their worst they never detract from the original material. 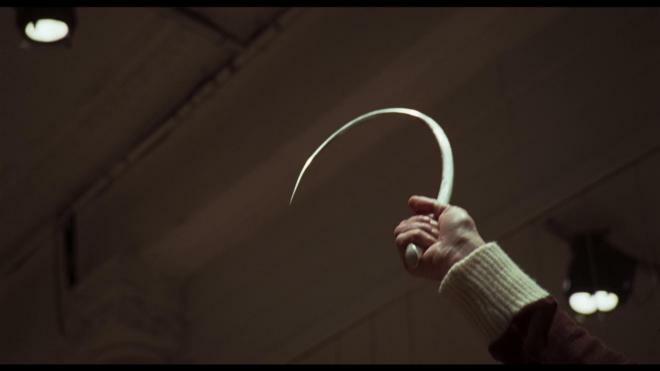 Guadagnino definitely did not make a shot-for-shot remake of Argento's Suspiria! It challenges your expectations while teasing you in which direction the story is headed. I appreciate that it didn't try to ape the bright primary-fueled color scheme of the original while also letting Radiohead's Thom Yorke fill each scene with a tonally dissonant and arresting barrage of sounds rather than mimic Goblin's iconic score. From the first frame to the film's final post-credit tease - Guadagnino's Suspira is a similar animal to Argento's but is entirely its own beast. It's beautiful and horrifying while challenging and frustrating. I frequently asked "what's the point of this" during several cutaways and scenes but loved the payoff that it ultimately leads to. I've spoken with many who like me loved this take and its indulgences while I know an equal number of people who either weren't impressed or flat out hate this movie. There isn't any middle ground. You're either going to love it or hate it, so see it for yourself and make your own call. I dare say don't watch it with anyone else in the room to influence your opinion. 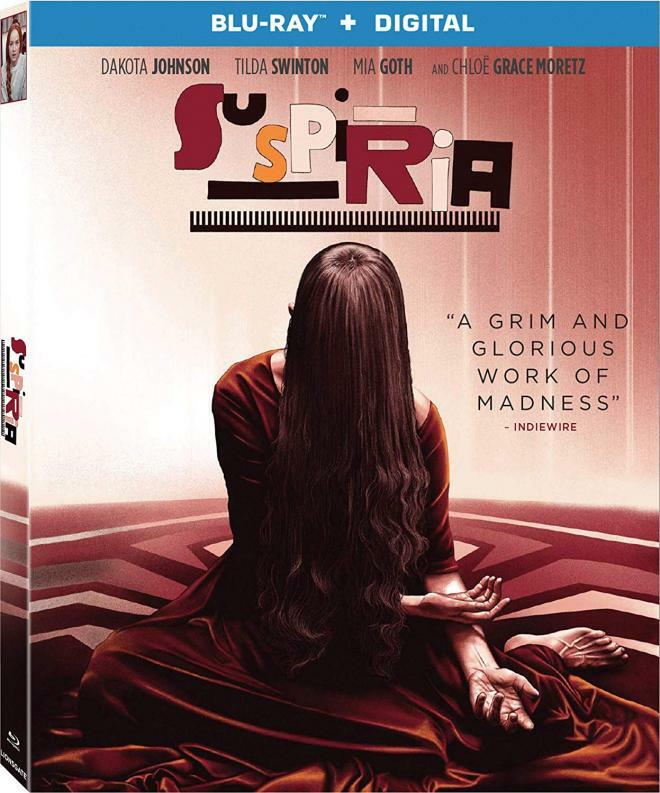 Suspiria arrives on Blu-ray courtesy of Lionsgate in a single-disc Blu-ray + Digital set. Pressed onto a Region A BD-50 disc, the disc is housed in an eco-friendly case with identical slipcover artwork. The disc loads to trailers for other Lionsgate/Amazon Studios releases before arriving at an animated main menu with traditional navigation options. I dearly wish this film had been a major hit at the box office, it needs a 4K UHD Blu-ray release! Shot on 35mm and finished on a 4K digital intermediate, this new Suspiria is a beautifully cold war drab 1080p 1.85:1 transfer that is in stark contrast to Argento's primary-saturated original. With fine film grain apparent but never out of place or too noisy, the image boasts clean and clear details allowing everyone's facial features and unique makeup to shine through beautifully - and horrifically in a couple of instances! As I said, this is a very drab-looking show stuffed with 70s Berlin cold war imagery - but that isn't to say primaries get lost in the shuffle. Instead, crimson reds, bright blues, and yellows are saved as highlight colors to fight against the olive greens, browns, and deep gray surroundings. Flesh tones are accurate looking and very healthy and natural looking. Black levels are deep and beautifully inky black giving each frame a wonderful sense of depth. White snow and clothing are crisp and bright without blooming. The only itty bitty anomaly I detected was some very brief banding that was barely noticeable - but that's it. Otherwise, this is a near flawless presentation that could possibly only get better with an uncompressed 4K UHD presentation. Here's hoping the import market doesn't fail us because I will happily order! As it stands, this is a great-looking image and a solid 1080p presentation that should impress most folks out there. Dolby Atmos fans have a new disc to demo - Suspiria makes terrific use of the object-based audio format. From pouring rain and rumbling thunder outside to the thumps and thuds of the dance company inside - the film's audio mix oozes with atmospheric activity. Rain is a big activity effect through I'd wager about 2/3 of the film. Either a scene takes place outside in a downpour, or the characters are inside and the rain is hitting windows or the sides of walls. 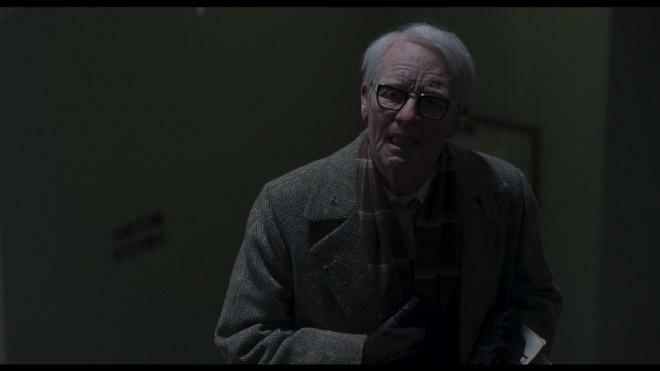 Similarly, when the film segues to winter, the sound of people stepping on brittle ice and snow gives a beautiful directional echoing effect against the concrete walls. But this mix isn't limited to merely accurately portraying the sounds of inclement weather. The dance sequences of the troop stomping their feet and slapping the floors are really impressive when the full company of dancers is active in the practice room. Then there is the first mirror-room murder sequence which is a combination of those dance sounds and some truly distressing grotesque bodily sound effects. It's delightfully horrific squishy stuff! Thom Yorke's score while not nearly as iconic as Goblin's original does offer its own extra essence of mood and angst pressing the low dissonant tones and punching in the LFE quite nicely. The rest of the mix is pitch perfect. Dialogue is clean and clear throughout even as various cast members strain under accents and prosthetic applications. Even when the film is at its quietest there is still an impressive amount of object-focused surround activity keeping the channels working. Levels are spot on without the need for adjustment, but I would say for the most impact bang for your buck, run this one a little louder than normal - when the shocking bits happen that extra punch is well worth it! Sadly, Suspiria is cursed with a lack of bonus features. What's here is informative, but not much and little better than your average EPK feature. For your own good, don't watch The Transformations of Suspiria until after you've seen the main film as it is full of spoilers - but also an impressive showcase of the practical effects that went into creating some of the gory bits. Otherwise, without a commentary track or a genuine making-of doc, this package is a bit of a washout. You're either going to love this new Suspiria or you're going to hate it. I loved it. I thought it was a welcome challenge to the genre and the notion of remakes as a whole. But I know others who were either frustrated or bored silly but this one. You're just going to have to see it for yourself. Do your best to not compare it to Argento's original - they're very different beasts. Lionsgate unleashes Suspiria onto Blu-ray with a beautiful film-like transfer with an equally moody and impressive Dolby Atmos mix to match. Unfortunately aside from the makeup featurette, the bonus features collection for this disc are a bit of a bust. 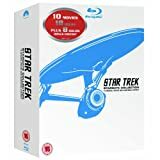 Without a true 4K UHD Blu-ray disc currently available - apparently Germany will be getting one in March - this is likely the best treatment this film will receive stateside. Highly Recommended.